Simon Milde, a partner with Adelphi Hospitality Group, center, poses with Adelphi Hotel staff and other officials affiliated with the restoration of the downtown Saratoga Springs landmark. 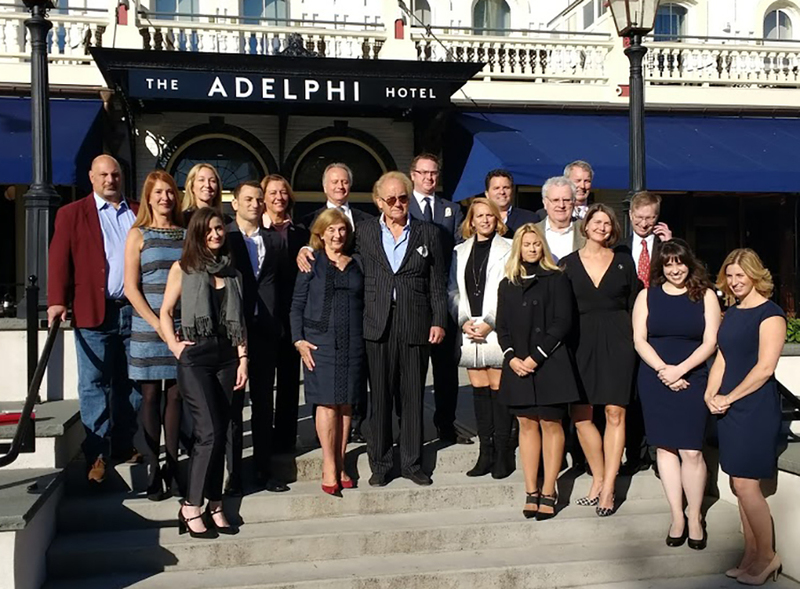 Local officials, business people and members of the Adelphi Hospitality Group gathered in front of the Adelphi Hotel on Oct. 19 to formally open the historic hotel at a ribbon cutting ceremony. Prior to the cutting of the ribbon, Mayor Joanne Yepsen; Samantha Bosshart, executive director of Saratoga Springs Preservation Foundation; Toby Milde, a partner with Adelphi Hospitality Group; addressed the crowd that gathered for the event. Yepsen noted the importance of keeping the history of the building and the city in mind during the renovation process. It was important, she said, to be patient during the process as all its pieces came together. 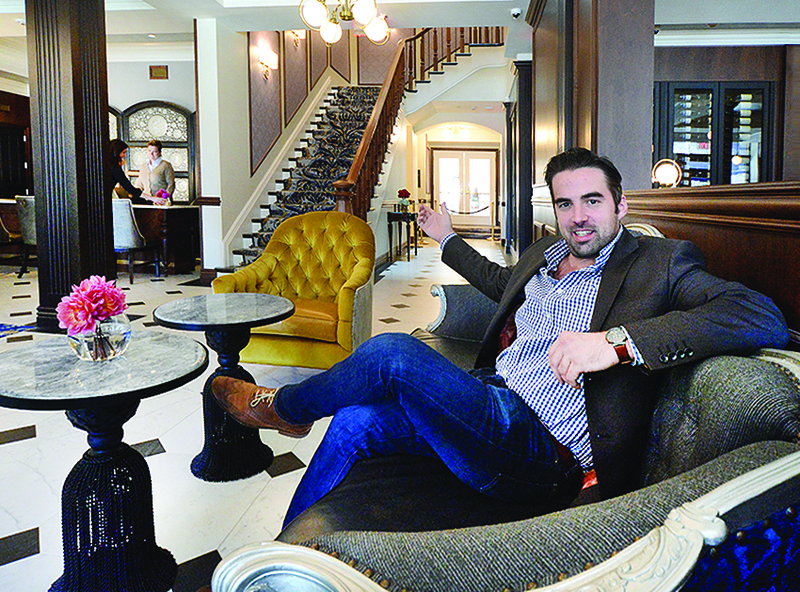 Steven Bouchard lounges in the lobby at the Adelphi Hotel on Broadway in Saratoga Springs where he serves as marketing coordinator. The historic hotel re-opened on Oct. 1. The historic Adelphi Hotel reopened on Oct. 1 after a five-year extensive renovation, both interior and exterior. The hotel originally opened in 1877 and is the last surviving hotel of Saratoga’s Golden Age. The Adelphi Hospitality Group collaborated with designer and architect Glen Coben of New York-based Glen & Co. to re-do the interiors, focusing on a sophisticated modern Victorian design “that personifies with a modern twist, and eclectic revival of, timeless ideals,” the company said in a statement. Dominick Ranieri Architect PC of Schenectady, was the architect leading extensive structural transformation and restoration. The Town of Ballston has received a $200,000 Microenterprise Grant targeted to small business start-ups, agribusinesses and commercial enterprises with five or fewer employees. The money comes from the state Community Development Block Grant program. Approved businesses may be eligible for a minimum $5,000 to maximum $35,000 award, according to Ballston Town Board member and program liaison Kelly Stewart. Each microenterprise business must be either owned by a person of low to moderate income or the project must result in the creation of at least one full-time equivalent position to benefit a low-to-moderate income person. The grant can fund up to 90 percent of the total project cost. The LA Group in Saratoga Springs is assisting the town in the administration of the grant application process. The Chamber of Southern Saratoga County will provide the necessary entrepreneurial training for recipients of the award. “The training component of the program that the Chamber will provide is mandatory and is a crucial component to the enduring success of the entrepreneurs who participate in the program,” said Jim Martin, senior planner and economic development specialist for the LA Group. The Saratoga Springs Horse Show is expected to move to Saratoga Casino Hotel next year. 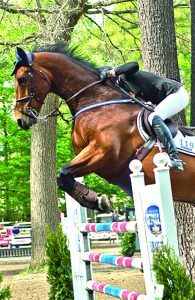 The Capital Fund of Saratoga County Inc. and Saratoga Casino Hotel are working to keep the Saratoga Springs Horse Show in Saratoga Springs. Pending a definitive binding agreement, the three-week show will take place in May of 2018 at Saratoga Casino Hotel, officials said. Going back to 1961, the Saratoga Springs horse show has been a long-standing tradition with equine fans and attended by some of the top equestrian talent in the Northeast. “We are thrilled to play a part in this project and we look forward to keeping this long running tradition alive in Saratoga Springs,” said Skip Carlson, vice president of external affairs and signature service at Saratoga Casino Hotel. Moving the horse show to Saratoga Casino Hotel will also provide the necessary infrastructure needed for the show, officials said. With over 800 stalls on property, the casino will be able to offer both the required grounds for hosting the show and barns needed to welcome over 500 anticipated horses that will be participating. A mixed-use project is planned on the site of the former Clifton Park Golf Driving Range. The former Clifton Park Golf Driving Range is being eyed by ay Albany company as the site of a mixed-use development project that would be include apartments. Paul Amedore, CFO of the Amedore Group, said he is hoping that a grocery store from one of the major chains is the anchor of the commercial segment. He did not specify who is being sought. 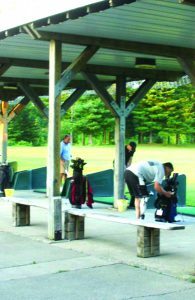 The property, at 1759 Route 9, recently was recently sold to Amedore by Ostoja Bucetic, who decided not to reopen his business, which included a driving range, miniature golf course and batting cages. The sale price of the 34.5-acre property was $3 million. The planning and zoning process could be challenging because the property is divided between the town of Clifton Park along Route 9 and the town of Halfmoon in the rear. Amedore said the parcel straddles two towns, Halfmoon and Clifton Park. He said the zoning is already in place in Clifton Park to allow the project. He will be working with Halfmoon to get the necessary approvals. Christina Myers has opened a store that carries honey, maple syrup, cheese, meat and vegetables, and items such as soaps, candles from about 35 different local farmers. and producers. The owner of Old Saratoga Mercantile, 1120 Route 29 in Schuylerville, left a job in journalism and now sells naturally grown produce and other natural goods that come to her from farms in the area. Old Saratoga Mercantile gives vendors in the region, some of whom previously sold only out of their homes, a place to sell their wares seven days a week. Christina Myers had been a journalist doing stories on local government and the political scene for 15 years. But going into business and starting a store was not, she said, the fulfillment of a lifelong dream. Actually, Myers and her then-fiancé purchased the vacant five-acre plot to build a home and wanted enough land to farm much of their own food. The idea to tear down a brick structure—an antique store up until the early 2000s—and to turn an outdated barn on the property into an old-time shop sprouted soon enough. She visited dozens of farms and producers, sampling their products, talking to the owners and customers, and doing all the fact-checking so her customers wouldn’t have to scrutinize every label to ensure the product was responsibly made. The Southern Adirondack ReStore of Habitat for Humanity of Northern Saratoga, Warren and Washington Counties is now open, helping raise money for the nonprofit group. The new Southern Adirondack ReStore of Habitat for Humanity of Northern Saratoga, Warren and Washington Counties opened to the general public with a ribbon cutting on October 2nd. The ReStore, at 1373 Route 9 in Moreau, is the first in the area. Sustained largely by a team of volunteers, Southern Adirondack ReStore is the Habitat for Humanity-style thrift shop, selling new and lightly used home furnishings, decorative accessories, lighting, appliances, building materials and more. Donations made by area businesses, decorators, contractors and residents, support the ReStore. Donations go to the store and are tagged for sale. Proceeds of each sale go to Habitat for Humanity of Northern Saratoga, Warren and Washington Counties and its efforts to build and maintain affordable homes. 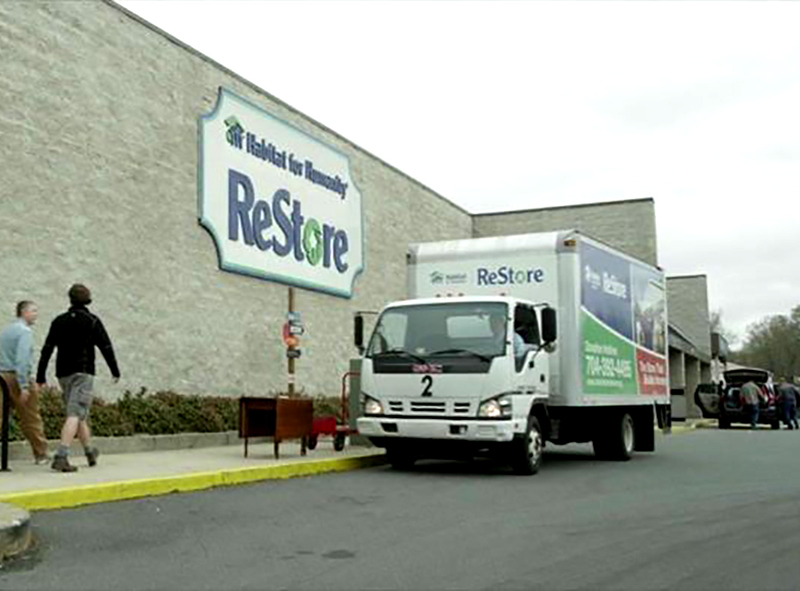 Through ReStore, Habitat is able to provide affordable home improvement items and furniture to local families, while also diverting usable materials from local landfills each year. The store is nearly 7,000 square feet. Leslie Shea, left, and Juliet Martino are the owners of Revive salon, at 3257 Route 9, Saratoga Springs. They offer services including hair color, hair cutting, manicures, pedicures and more. 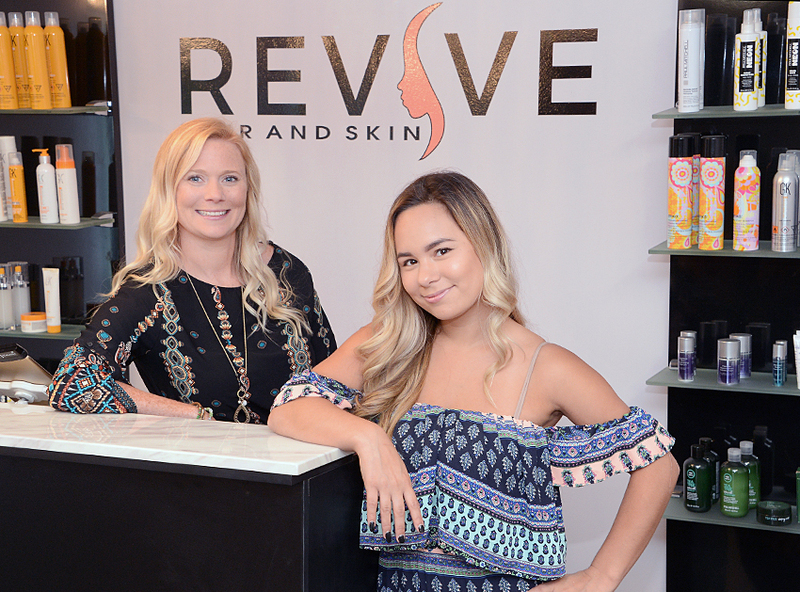 The owners of Revive salon, at 3257 Route 9, Saratoga Springs, understand that both men and women like to feel and look their best. Juliet Martino and Leslie Shea have worked hard to create a salon that they are proud to call their own. Martino said that she and Shea have worked together in several other locations. 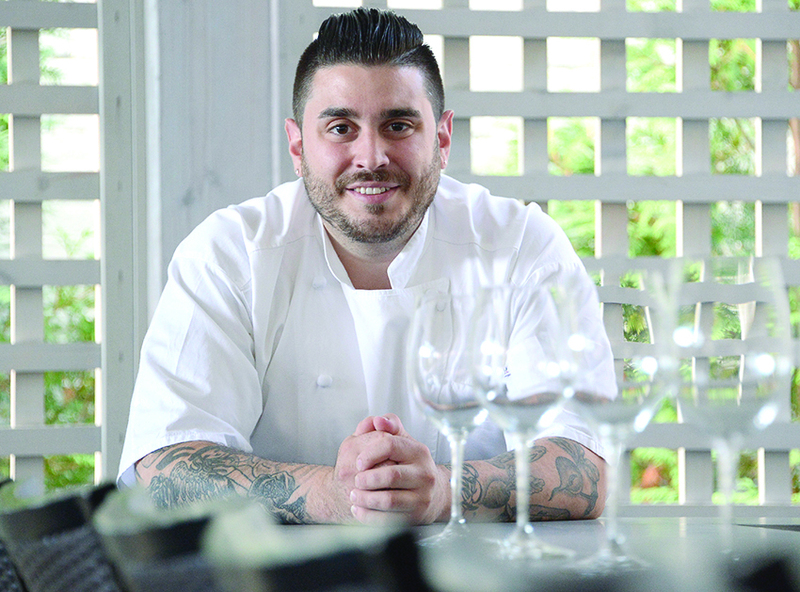 Since opening on Route 9 this past summer, business has never been better for either of them. Martino, 26, has eight years experience in the hair industry, is a licensed cosmetologist and specializes in hair color. Shea, 35, is an aesthetician and nail technician. She has been providing skin care and nail treatments for over 10 years. “She started her skin care adventure at a dermatologist then moved to the salon industry to grow her own business, “ said Martino. In his new position, Connolly, a licensed nursing home administrator, will be responsible for the direction, supervision, compliance and maintenance of the facility’s day-to-day operations, as well as its adherence to federal, state and local laws and regulations. Connolly, who has more than 35 years of experience in the health care field and is a Fellow of the American College of Healthcare Executives, has been honored on numerous occasions for this contributions to healthcare and community service in the Capital Region. He holds an undergraduate degree from Hamilton College and masters degrees in both business administration and public health from Columbia University. Daniel D. Bruno, co-owner of Bruno & Bruno Financial Services in Saratoga Springs, was named a member of the 2017 Chairman’s Council of New York Life. Members of the Chairman’s Council rank in the top 3 percent of New York Life’s sales force of more than 12,000 licensed agents in sales achievement. Bruno has been a New York Life agent since 2007 and is associated with New York Life’s Albany General Office in Latham. Bruno and Bruno Financial Services is not owned or operated by New York Life or its affiliates. He is a graduate of New York Life’s Advanced Planning Group’s Coaching Series, a client-centered planning process with the goal of helping clients crystalize their planning objectives and design appropriate solutions. Bruno is a member of the National Association of Insurance and Financial Advisors. Arrow Financial Corp. announced Edward J. Campanella joined the company as senior vice president, treasurer and chief financial officer for Arrow, and executive vice president and chief financial officer for the company’s lead subsidiary, Glens Falls National Bank and Trust Co.
Campanella will be responsible for planning and management of all finance, treasury and accounting functions for Arrow, which reached a record $2.7 billion in assets at the end of the second quarter, according to company officials. He will be based in Glens Falls and report to Arrow President and Chief Executive Officer Tom Murphy. Campanella served as CFO of National Union Bank of Kinderhook. He brings 19 years of finance and banking experience to Arrow. Prior leadership roles include treasurer and director of finance at Opus Bank in Irving, Calif., and treasurer at Cambridge Savings Bank in Cambridge, Mass. He began his career in finance as an analyst for Darling Consulting Group. Campanella earned a bachelor’s degree in business administration from Suffolk University in Boston. He succeeds Terry Goodemote, who in February announced his intent to retire as Arrow CFO after more than 20 years of service to the company, including more than 10 years as the chief financial officer.